The Lawton Scholars Program does not assign advisors. Your academic advisor is already assigned to you through your school or college. You can find the name and contact information of your advisor on PAWS on the right side of the main “Student Center” page. I was wondering if the academic advisor I have to meet with is my regular academic advisor? Yes, the academic advisor that you meet with would be the one assigned to you through your school or college or the advisor who assists you with your class choices and graduation plan. Where do I get/upload the academic advisor form now? As of Spring 2017, we have stopped using the academic advisor form. Now your advisor must enter their meeting notes into the Student Success Collaborative (SSC). Make sure to mention that you are a Lawton Scholar to your advisor during your meeting so they do this. Is there a way that we can confirm that we visited the Career Planning and Resource Center afterwards? The Career Planning and Resource Center meeting is tracked when you sign-in at the center. We have limited access to this information and only get periodic updates as the information is maintained through another office. As long as you attended a meeting and signed in, you have fulfilled the requirement. I wanted to know if this requirement can be waived since I already know what I’m planning to do with my future. I was hoping I wouldn’t have to do this since it will not really do anything for me since I know what I want to do and already have a plan. The Career Planning and Resource Center requirement will not be waived. The Center provides many more services than selecting a major or career path including resume and/or CV building, cover letter writing, graduate school planning, job searching, interview skills, and salary negotiation preparation. As career development is a life long process, we encourage you to take advantage of the services offered to prepare you to enter your chosen field. Do I need to maintain 24 credits meaning 12 per semester of 24 in a full school year? To be eligible for the Lawton Scholars Program, you need to be enrolled in 12 credits at the census date for the semester (usually two weeks or so into the semester). To remain eligible for the program, a student needs to complete 24 credits in a full academic year (Fall, WinterIm, Spring, and Summer semesters). If I drop it will I need to add a late course to maintain 12 credits this semester? You will not need to add a late course to remain in the Lawton Scholars Program. You may make up the missing credits either during WinterIm, Spring, or Summer to reach the 24 credit requirement. If you enroll in summer courses to meet the 24 credit requirement, you will need to notify Ruth Schulze (rschulze@uwm.edu) in Financial Aid so that your summer credits are counted for the Lawton Scholarship. Are there any forms that I need to fill out, or get approval before I drop a class? We strongly encourage you to talk to your Academic Advisor before dropping a course. They will be able to provide you information about how it may impact your financial aid, graduation plan, and successful academic completion. When do I have to take Econ 110? Lawton Scholars are required to complete Economics 110: Economics of Personal Finance within the first two semesters of being awarded (so you have Fall 20XX or Spring 20XX to complete the course). The course is also offered during the summer. If you enroll in the summer course, you need to let Ruth Schulze (rschulze@uwm.edu) in Financial Aid know so that you receive credit for the course. Is it an online course or an in-lecture course? If there is an online course, how can I sign up for it because I have never took an online course before. There are both in-person and online sections available. To sign up for an online course, you will enroll through PAWS the same way that you enroll for in-person courses. I have a question regarding the requirement of taking the financial literacy course. I was in a summer bridge program that ran the course and I was interested in hear if I would have to take the course again. If I had already taken Econ: 110 am I required to take it again? Lawton Scholars are only required to successfully complete the Economics 110 course once. If you have already successfully completed Economics 110: Economics of Personal Finance, you will not need to take the course again. I am a senior with a heavy course load so that I can graduate on time. Do I have to take Econ 110? I am currently a new transfer student at the University of Wisconsin – Milwaukee. Before attending UWM, I attended another UW school. Am I eligible to receive the Lawton Scholarship at UWM? As a first semester transfer student, you may become eligible in the future once you have a UWM GPA. If you are eligible and funding is available, you will receive an email from Financial Aid. How do I apply for the Lawton Scholars Program? Who is my Lawton Scholar Success Advocate? Your Lawton Scholar Success Advocate is a student whom has more than likely emailed you already. However, if you cant find this email and have no idea who they are, please stop into the IEC and we will help you in finding out who your success advocate is and how you can get in touch with them. What happens if I haven’t met with my success advocate yet? Can I see another success advocate that is available instead? I you haven’t met with your success advocate, we recommend getting in touch with them as soon as possible to schedule a meeting. If for some reason they don’t get back to you, please stop by the IEC and we will contact them for you. If they still haven’t met with you after this please let us know and we will make accommodations. It is our preference that Scholars meet with their assigned Success Advocates unless there are extenuating circumstances. How do I make an appointment with my Success Advocate? To schedule a meeting with your Success Advocate, you need to contact them directly. A majority of the success advocates use a website called signupgenius.com in order to schedule their meetings so also check your email for a link to sign up for a meeting with them through that site. Where do I go to complete the PRIDE survey? You can access the PRIDE survey by going to the Lawton D2L page. Here there is a link that will take you to the PRIDE survey. I just checked my D2L and it says that I did not complete the PRIDE Survey but I actually took the survey weeks ago and it said I completed it, so I am not sure why it is saying that I did not on D2L. Can someone help me with this? We receive periodic updates on who has completed the survey throughout the semester. It may be that we just have not received the information indicating that you responded to the survey. We highly encourage you to take a screenshot of the results page of the survey upon completion. If you do have this and show it to us we can correct this error quickly. If you are concerned about whether or not we have confirmation of you taking the survey or not, please stop into the office and ask us or email uwmlawton@uwm.edu. I did not complete the PRIDE Survey. The PRIDE survey remains open through the entirety of the semester. However, there is a due date in place for when Lawton scholars have to take it (which is available for reference on this website as well as the D2L page). If you did not take it before this due date, you will not receive funding from Lawton in the future semester. I am currently a senior in the Lawton Scholars program. I have been a part of this scholarship program for a few years now and this is the first semester that a success advocate has either (or both) not been appointed to me or has not reached out to me. I still haven’t received anything from any advocate. I will be graduating this December and the e-Portfolio is only due in the spring, so should I submit an e-portfolio this semester? Because you are graduating this Fall and the e-Portfolio is only due in the Spring, you do not need to submit an e-Portfolio. I’m studying abroad. How can I fulfill the Lawton Scholars Program requirements? We have had a number of students study abroad and complete Lawton successfully. Your requirements will not change. You will be required to complete the PRIDE survey as it is accessible via D2L. You will still meet with your Success Advocate (preferably via Skype) and with your academic advisor (via Skype if able, otherwise email communication will suffice). For your e-Portfolio, you can reflect on things that you did this semester and on the things that you get involved with on campus abroad. Your study abroad experience definitely fulfills “Explore Milwaukee and Beyond” and if you get involved on-campus abroad or volunteer abroad, those will count as well. 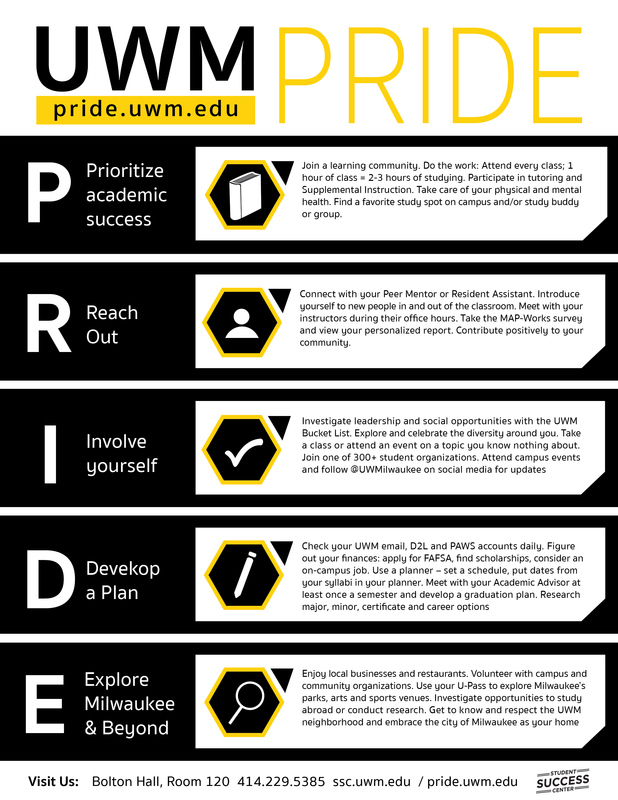 In addition, because the e-Portfolio is only due once an academic year, if you are back at UWM in the Spring, you can fulfill the requirements here. Is it possible for the Lawton Scholarship grant to be awarded for Winter Interim study abroad trips? The Lawton Scholarship is only awarded in Fall and Spring semesters. However if you have access funds from the Fall semester, you may apply those to your study abroad trip. We also would like to encourage you to apply for the Study Abroad Diversity Scholarship. The application to do so is below. I am studying abroad. How do I prove that I met with my Academic Advisor? Because you are studying abroad, we will accept an email confirmation of your appointment from your academic advisor. They just need to email us at uwmlawton@uwm.edu to verify that you two have discussed your course schedule or other academic information.